It's a rainy yucky afternoon, so I decided to watch some TV with my cats. Last night Andrew and I finished Stranger Things Season 2 on Netflix, and I have to say I really liked it. A little disappointed that a cat dies, but the (mostly) uplifting ending is nice. So what other great things does Netflix have to offer? 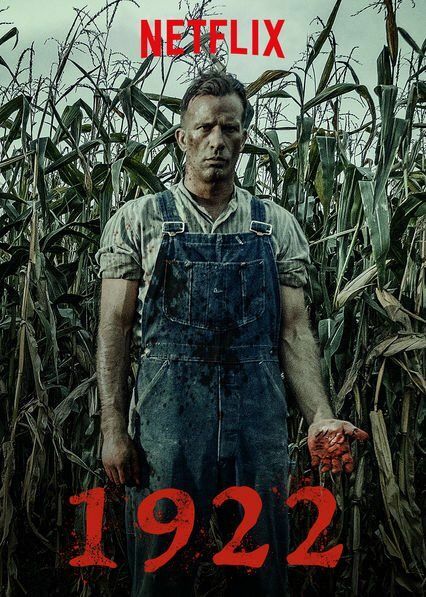 Today I checked out 1922, a Netflix Original based on the Stephen King story of the same name. 1922 is more of a parable, than a horror movie, unless you want to talk about how people can be horrible. It's about a husband and wife, Wilfred and Arlette, with a teenage son, Henry, that live on a 100 acre farm in Nebraska in 1922. The husband recounts in a letter why he kills his wife and the tragic consequences that followed. Arlette inherited the farm land and wanted to sell both the house and the land to a company for lots of money, get a divorce, take Henry and move to Omaha to open a dress shop. (She really should open a dress shop because the few outfits we see her in are pretty great.) She DID give Wilfred some options, but really she just wanted out of the marriage. His southern stiff-jawed accent is a little difficult to understand, so his sweet talking can't be the reason they got married. It's hinted that they only got married because she was pregnant. Check out the print on this dress! If I had to guess, I'd say it's vintage fabric. The red piping on this dress!!! The beginning of the movie is shot with a focus on things around the farm ~ hinted at ways Wilfred might kill her. There's a close up of an axe, a stone well in the backyard, and lots of cornfields. I was really hoping for a Children of the Corn vibe, but nothing exciting takes place in the fields. Knowing that Arlette plans to sell the land with or without his consent, Wilfred manipulates his son into taking his side in the matter. 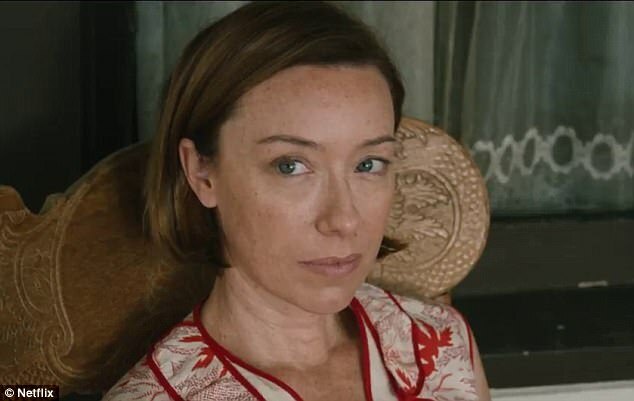 Reminding Henry that he wouldn't see his sweetheart ~ Shannon ~ that lives next door and he'd have to conform to city life if his mother drags him away. Planting these ideas in Henry's head convinces him that the only way to deal with his mother is to kill her. Wilfred ~ in another conniving move ~ tells Arlette that he will sell the land and move with her. She calls for a celebration and gets drunk and falls asleep. Everything is going as planned. Henry holds her down while Wilfred slits her throat to make her death quick. This is the part of the story where Wilfred begins to regret killing her and involving his son. He even says, "Murder is work." (I laughed at this because, duh, yeah it is.) The story is a slow-burn spiral-out-of-control from here. Her body gets tossed in the well along with the bloody mattress and that's all we see of her until...Wilfred checks on her body and it's rat infested. This creeps him out. A lawyer comes by from the company that wants to buy the land looking for Arlette, the sheriff comes by too. Husband and son lie to both of them, stating that they don't know where she is. Henry gets Shannon pregnant. He starts to stand up to his father and he runs away with her. Wilfred is upset because who will inherit the land now? All alone in the farm house he begins to have visions of his dead wife and her swarm of rats. She tells him that their son is robbing stores and banks for money, which is true. Shannon ends up getting shot and Henry kills himself. Wilfred is distraught. He keeps repeating, "Please just kill me." Only the ghost of Arlette doesn't kill him. One of her rats bites Wilfred's hand and it gets infected and has to be amputated. Does this mean that the rats are real and not a figment of his imagination? Both kids bodies are returned to their parents. 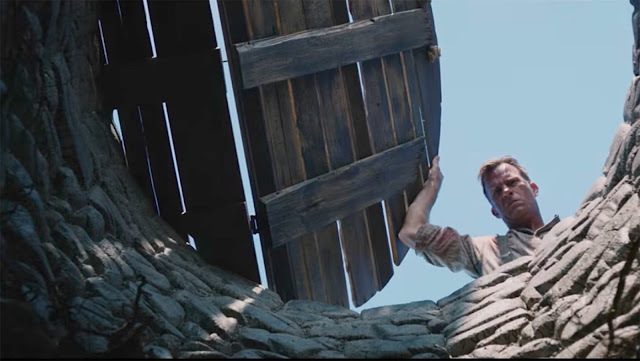 Wilfred offers his house and land to the father of Shannon, but at this point, his daughter is dead, his wife left him, Wilfred's house has a leaking roof and is in shambles. Why would he want it? He wants nothing to do with the family that ruined his swell life. Wilfred suffers from mental anguish. He ends up selling the house and moving to Omaha. (What his wife wanted to do to begin with!) The rats are still following him around. By 1930 Wilfred dies in a hotel room after he finishes the story of his life from 1922. 1. Your wife knows best. (lol. Just kidding.) Please don't kill her if you disagree. 2. There's always another way. 3. In the end everyone gets caught. 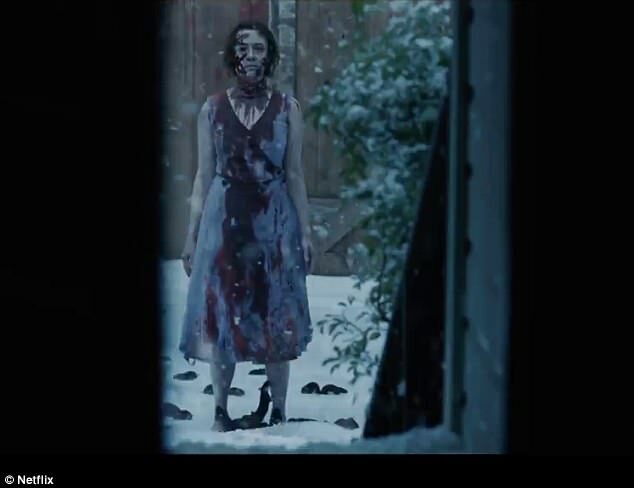 Trailer makes it look much creepier than it really is.